Arthur Erickson’s combination of modernism and neoclassicism evokes I.M. Pei’s design for the National Gallery of Art’s East Building across Pennsylvania Avenue. The new building was designed by British Columbia architect Arthur Erickson. 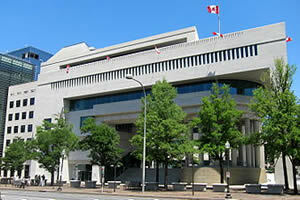 This decision generated some controversy as Erickson was handpicked by his friend, Prime Minister Pierre Trudeau, but the building itself was much acclaimed. The design has been described as “making fun of the ridiculous terms to which buildings must adhere in Washington. He was mocking the US and all of its imperial pretensions”.